Combination of greatest benefits of London Dry Gin, Distilled Gin and Genever. Macerated with cucumbers in the last seven distillation steps. 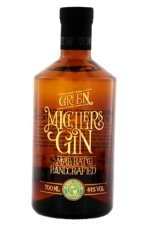 Rich in cucumber flavor that gives Michlers Gin Green an unmistakable individuality.